Part bred Trakehner by Holme Park Kobalt, sire Oliver Twist. This pedigree is world famous, as Kostolany (Kremona's Sire) was also Sire of EH Gribaldi and Grand Sire to EH Totilas. Dam Tredethy was bred for 3/4star eventing by prolific award winning eventing breeders, Preci Spark. She is half sister to 4 star Badminton competitor Trebetherick, Treloar 3 star and full sister to Treblare 3 star. She has some of the best eventing bloodlines available, being by Fleetwater Opposition, who needs no introduction, out of a 3/4 TB and 1/4 ISH mare by Puissance, another great eventing stallion. Her oldest offspring are about to start competing this season. Sire Kobalt in 2014 passed his 70 day stallion performance test in Germany scoring a 10 for character! He achieved a Class 1 Elite. He has proved to be an extremely willing horse who is easy to train and honest and bold. He has all the athletism required for a modern sport horse and more importantly, a good mind. 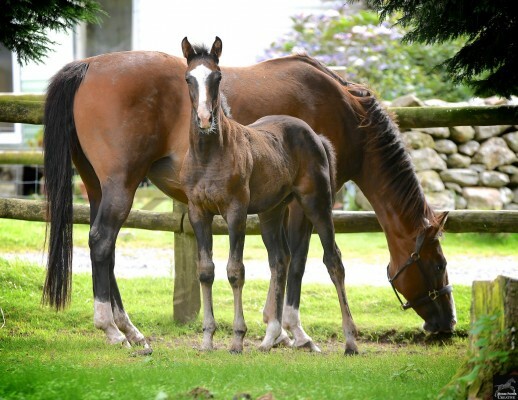 His first foals born jan 2015 - all stunning, long legged with outstanding temperaments. Shows tremendous speed and agility and would be suitable for dressage or eventing. Would suit an amateur or professional. She is bold, friendly and inquisitive and has been well handled since birth. FULLY JABBED UP TO DATE READY TO GO ! Please call or text as not very active on email.